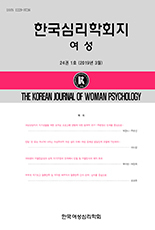 김시연, 백근영, 서영석,(2010).대인 성적 대상화 경험과 외모에 대한 사회문화적 기준의 내면화가 섭식장애 증상에 미치는 영향.한국심리학회지: 여성,15(4),613-634. 본 연구에서는 대상화 이론 및 섭식장애 관련 선행 연구들을 바탕으로, 대인관계에서의 성적 대상화 경험이 외모에 대한 사회문화적 기준의 내면화, 신체감시 및 신체 수치심을 매개로 섭식장애 증상에 영향을 미치는 인과적 구조모형을 설정하고 여자대학생들을 대상으로 그 적합도를 검증하였다. 또한 사회문화적인 압력에 따라 섭식장애와 관련 변인들의 영향력이 다를 것으로 가정하여 무용 전공 여대생과 일반 여대생을 대상으로 모형의 적합도 및 개별 변수의 영향력을 비교하였다. 이를 위해 서울 및 경기 소재 대학의 일반 전공 여대생 154명과 무용 전공 여대생 98명을 대상으로 설문조사를 실시하였다. 자료 분석 결과, 연구모형은 전체집단뿐 아니라 각각의 집단에 대해 적합한 것으로 나타났고, 전체집단의 경우 연구모형은 섭식장애 증상 변량의 58%, 무용 전공 집단은 49%, 일반 집단은 68%를 각각 설명하는 것으로 나타났다. 일반 전공 여대생과 무용 전공 여대생을 구분하여 연구모형의 적합도과 경로계수를 비교한 결과, 우선 본 연구에서 설정한 매개모형은 두 집단 모두에서 자료에 적합한 것으로 나타났다. 그러나 외모에 대한 사회문화적 가치의 내면화가 섭식장애 증상에 미치는 영향은 무용 전공 집단에서 더 큰 반면, 대인간 성적 대상화경험이 신체감시에 미치는 영향과 신체감시가 신체 수치심에 미치는 영향, 그리고 신체 수치심이 섭식장애 증상에 미치는 영향은 일반 여대생 집단에서 더 큰 것으로 나타났다. 연구결과를 토대로 시사점과 추후연구를 위한 제언을 논하였다. This study extends the literature on eating disorder symptomatology by testing, based on extant literature on objectification theory, a model that examines (a) links of interpersonal sexual objectification experiences to eating disorder-related variables and (b) the mediating roles of internalization of sociocultural standards of beauty, body surveillance, and body shame. The present study also tested these core constructs with dance majors, as their experiences with these constructs may differ. A multiple-groups analysis comparing these women (n = 98) with non-dancers (n = 154) indicated that objectification theory can be extended to the dance majors. However, structural invariance analyses revealed that the relationships among the study variables may not be identical for these groups. The dance majors had a stronger relationship between internalization and disordered eating but weaker relationships between body surveillance and body shame, between body shame and disordered eating, and between interpersonal sexual objectification experiences and body surveillance than did non-dancers. Implications for practice and future research are discussed.